Did you know that we have a podcast? Well, we do. It’s called After the Jump, and it’s a discussion of a hodgepodge of topics that don’t make it up to the blog for one reason or another. But that doesn’t mean it’s not worth your time! Am I underselling this? Anyway, give us a listen if you like to hear goofy guys talk goofily about goofy things. Also there’s cussing. See the complete list of podcasts here. Subscribe to our podcast’s RSS feed here. Subscribe to us on iTunes here – iTunes will automatically download each new podcast as soon as it’s posted. The theme music for After the Jump is called "CPU Mood," composed by the excellent chiptune artist FantomenK. He has a Myspace profile you should check out, as well as an account over at 8-Bit Collective. "CPU Mood" is used with permission. 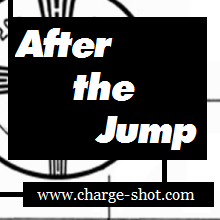 After the Jump is updated on Sundays.